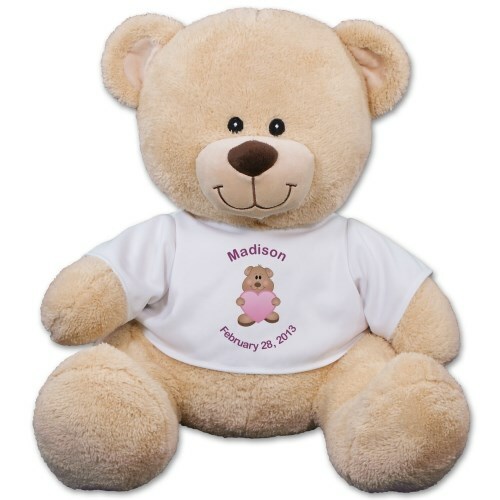 Announce the arrival of your new bundle of joy with a delightful teddy bear like this! This magnificent keepsake helps you hold on to those special memories when your child was born and it becomes a dear keepsake she’ll always have. This Pink New Baby Girl Design is featured on our Sherman Teddy Bear. It is truly one of a kind because you can personalize the t-shirt with any two line custom message for free! Sherman is available in three different sizes. Please choose from our 11 inch, 17 inch or our 21 inch teddy bear. Free Gift Wrapping and a Free Gift Card are included to create a thoughtful presentation. Additional Details A Plush Teddy Bear from our New Baby Girl Collection becomes an exquisite keepsake she'll always have and always enjoy. Shop 800Bear.com for all of your Plush Gift Ideas.